Rewatching the James Bond films chronologically. Now we’re forehead-deep in the 1970s, with 1977’s The Spy Who Loved Me, or, as I like to call it, Car That Turns Into A Submarine. Bond blurb: English and Russian submarines have both mysteriously disappeared. Bond and female Russian agent Major Amasova, a.k.a. Agent Triple-X (heh), are both on the case, first as competitors, then as reluctant partners, and then as full-on partners, if you know what I mean. The case leads to billionaire ocean researcher Stromberg, while Bond and Amasova are pursued by metal-toothed henchman Jaws. Bond background: We get a quick rundown of Bond’s history, officially connecting the dots that were only hinted at in previous films. Bond is a Cambridge graduate who became a naval commander and was then recruited by MI6 to become a spy. His short-lived marriage and dead wife are also mentioned. Bond baddies: Stromberg is kind of uninteresting, with his plan to control the world’s oceans. I guess we’ve seen this type of villain in the other Bond movies (Blofeld, mostly) so he doesn’t bring anything new to the table. The real star is Jaws. Played by the astonishingly huge Richard Kiel, Jaws is unstoppable and something to be feared, but also quirky and funny in his own way. First, it’s not enough to give Jaws scary teeth, they keep coming up with different ways for him to use the teeth, which I like. Second, Jaws keeps coming back for more, no matter how many times Bond defeats him. Fun fact: Richard Kiel played the Hulk in the pilot for the ‘70s Incredible Hulk TV series before the part went to Lou Ferrigno. The scene where Jaws tears apart Bond’s car with his bare hands gives us a hint of what his Hulk would’ve been like. Bond babes: Just as The Man with the Golden Gun attempted to create a villain who’s Bond’s rival, The Spy Who Loved Me attempts a romantic interest who’s his rival. There’s a running gag where he stops to explain something to her, only for her to already be knowledgeable on the subject. Barbara Bach is kind of cold and distant in the role, though, lacking the feistiness of Tatiana in From Russia With Love. Still, I always say that it’s best when the love story is integral to the plot instead of tacked on, and this movie is perhaps the best example of that. Bond best brains: Here’s where we really get into the “Q wacky workshop” thing, with guys testing out crazy gadgets, in the form of weapons that look like ordinary objects. Bond has a watch which prints out a little tickertape message from M, which seems outdated in a movie with satellites, computers, and microchips as plot points. Best of all, though, is the car that turns into a submarine — one of many of its built-in gadgets and weapons, I might add. Too bad the submarine car is so prominently featured in the movie’s marketing. Imagine what it would’ve been like to not know about it and have your mind blown when it transforms. Bond bash-ups: Lots of great action scenes in this one. We begin with a great ski chase ending with a big jump, followed by a lot of fights with Jaws, an awesome car chase ending with the submarine transformation, and another massive finale aboard the villain’s secret submarine base, with explosions and gunfights galore. Bond baggage: Jaws is of course a reference to Steven Spielberg’s mega-blockbuster Jaws, released two years earlier. Also, does anyone else think that this movie’s score is maybe, just maybe, a little bit… disco? Bond babble: It’s as if the producers went through the previous Bond films, picked out the stuff that worked the best, and included it all in this one. 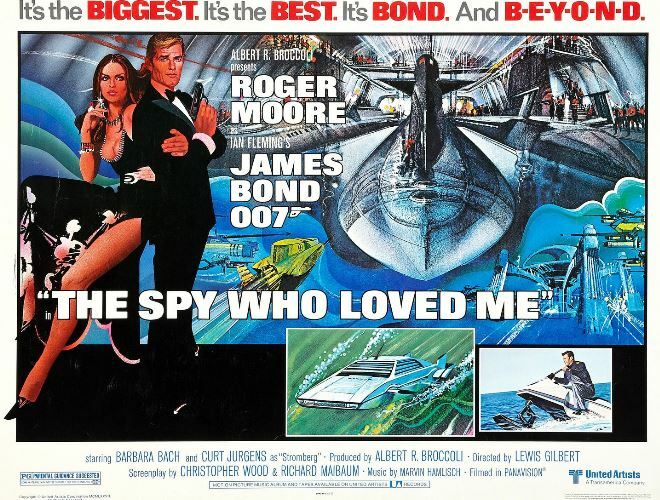 The huge henchman and the gadget car evoke Goldfinger, the love story and train fight evoke From Russia With Love, and the huge, practical set getting blown up during the finale evokes You Only Live Twice. The alchemy works, though, and The Spy Who Loved Me is a great ride. 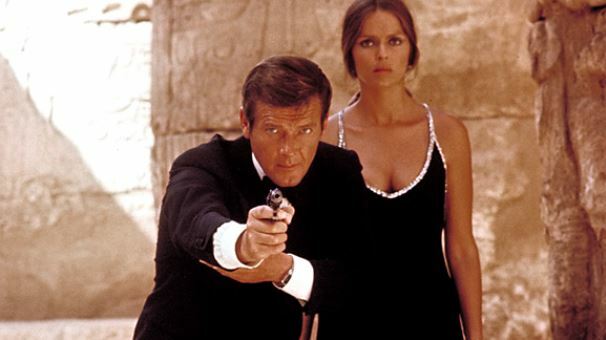 All the Roger Moore haters should revisit this one, because it’s everything we think of when we think of 007. Next week: Bond… in SPAAAACE!! !